While the advancement of technology sometimes drives us to the point of aggravation, the power of FaceTime has been an effective collaboration tool for Cascade Alliance members. 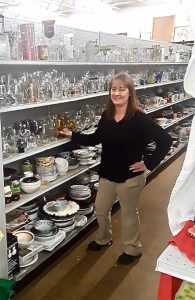 When Big Reuse was reorganizing to make more space in their store this week, questions arose over shelf placement and the display of certain items such as lamps and picture frames. Tyree and Steve jumped on Facetime so she could easily see what items needed to be changed in a display and give suggestions on how to organize other items to maximize their space. Because the two of them had interacted before, the Facetime encounter was easy and comfortable. This style of remote consulting can be useful and we are excited to see collaboration is a recurring trend. *Pictured above: Tyree Ward at one of our St. Vinnie’s location in Eugene, OR.